AGD Rental offer the widest range of Silent Piling Equipment for hire in the UK, drawing from the fleet as necessary of Giken Europe as their dealer covering the UK, Ireland and the majority of the EU. Giken is the inventor of silent piling technologies and the worldwide market leader in the manufacture of silent piling equipment for the silent, noiseless and vibrationless installation of steel sheet and tubular piles. In 2017 they celebrated their 50th anniversary of being in business. With the Government's Policy For Noise now in force, silent piling is becoming the normal way to install sheet piles and we have the equipment available to deal with all types of soil and pile sections. The silent piling technology can be applied in both soft and hard ground conditions. For the installation of U profile sheet piles 600 mm, 700 mm and 750 mm wide and Z profile sheet piles from 570 mm to 700 mm wide, in singles and pairs, and tubular piles up to 1200 mm diameter. 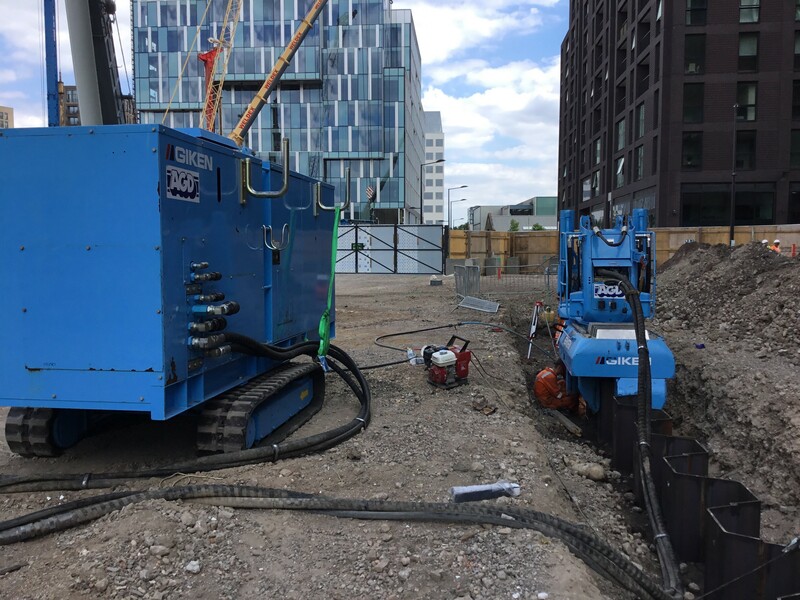 Giken Silent Pilers and Super Crush Pilers are available for hire with experienced operators along with ancilliary silent piling equipment such as Super Jet Reels, Water Jetters, Clamp Cranes, Pile Runners, Unit Runners, reverse walking attachments etc. We have recently invested in 2 units brand new F201 and 1 unit F301 silent pilers for our rental fleet. We welcome enquiries for Silent Piler Hire from anywhere in the European Union. Informative videos and specifications sheets are available here for download. You can view a list of case studies here. Please contact us for further information and rental rates.